WOW!! 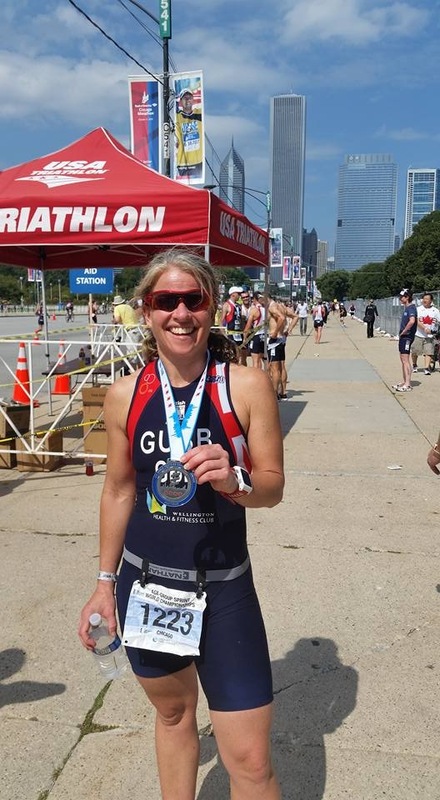 – So here I was having got to Chicago to race in the ITU World Sprint Triathlon Championships. Really? Was this really happening? – I half expected to get to registration and to be told I wasn’t on the start list and I was at the wrong race! It was all pretty overwhelming but at the same time incredibly exciting. Chicago had turned into a Mecca of triathletes – the atmosphere was buzzing with everyone doing last the minute checks on their bikes, squeezing in a couple of runs, heading up to Ohio Beach for the last swim practice – everyone gearing up for that all important “A” race with the months of training behind them – Americans, Australians, New Zealanders, Canadians, Mexicans, Brazilians – there was a sea of national kits everywhere. 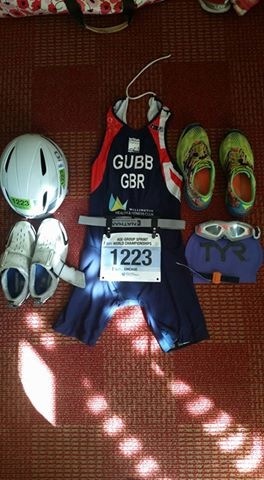 We were staying at the GB Team Hotel – having not been to one of these events before I definitely needed to be in with the best chance of being in the right place at the right time, as those who know me will know “late” and “disorganised” come pretty naturally to me. 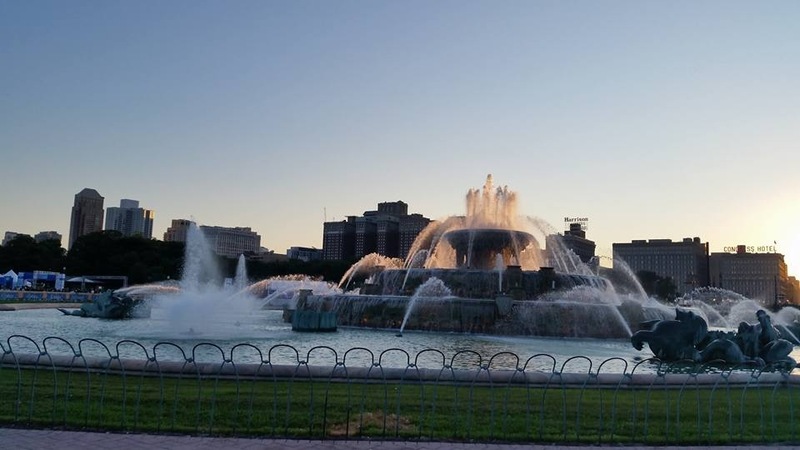 The hotel couldn’t have been in a better location – 1km from the Expo and 500m from the bike and run course and the famous “Buckingham Fountain”. 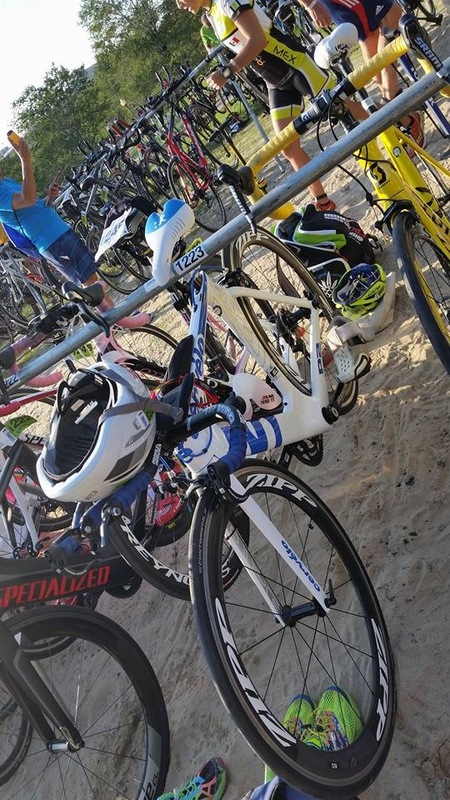 We knew from the pre-event information we wouldn’t be able to have a practise on the bike course and being there we soon realized why looking at the highway – 4 lanes of traffic either way requiring human traffic control at each crossroads to ensure order! Fortunately around Lake Michigan which was to hold the swim, there was a run and bike trail. I’m not sure how far this trail actually went as looking at Lake Michigan it really didn’t feel like you were looking at a lake at all – more like the Atlantic – apparently it contains one third of the natural fresh waters in the world. Its enormous -the other side was no where to be seen. So although we tried to put my “feet up” as much as possible in the build up to race day, there was lots to do to keep busy! There was no time to go off sightseeing and see the city; each day was filled with triathlon related activities with very strict timings. I wasn’t complaining – this is why I was here and I was loving it! I woke on Race Day…..actually I think I had been awake all night the reality setting in. Up early for the usual “pre race” breakfast – dry cereal and today as the race was late morning I snuck half a bagel in too. Then it was off to check the bike in racking, which we had had to do the day before. Transition was at the top end of the bike course and was nothing “posh”, no red or blue carpet just your standard patch of grass….actually I was racked “on the beach” ….well in a large amount of sand! This was bothering me slightly – I wasn’t sure how sand in the toes was going to be for my run and I certainly wasn’t going to have time “to de-fluff ”. It was a “clean” transition so there was nothing extra allowed in there – no boxes, bags, towels – only items required for racing allowed. Tyres had to be re-inflated having let them down the day before due to the heat – a burst tyre was definitely not on the race morning agenda. Everything sorted, double and triple checked…. a look around to walk through the Swim In, Bike Out, Bike In and Run Out and it was time to head out and be reunited in a few hours. The race wasn’t until 11.40am so we had a couple of hours for race nerves to really kick in. Messages of support from my sisters and friends – strict instructions to hang around and find the camera on the finish line as it was on Triathlon Live and they were all going to be glued to their screens willing me to appear! The temperature was hotting up and we knew we weren’t going to be able to escape being out in the midday heat – over 30 degrees, definitely no shade on that course. We went for a drink downstairs in the hotel and I thought I’d get some fresh air and sit in the shade for a while – the shade was far too hot – that was going to zap all my energy before I’d started. The GBR suit was on – this was it! Down at the swim start I met up with some other of the Age Group girls in my wave. I knew there was about 80 girls in my wave, up to 20 of them GBR girls. It was all very friendly, everyone wanting to do their best and have the race of their life. As with all races there are those who like to chat and those that like to stand and focus. I’m more of a chatter – I don’t do quiet very well! Time to line up in the pen – I’d had my wetsuit on for a good 20 minutes and it was roasting, time to get in that water. Strict instructions from the Sergeant Major Race Official about the race which included saying “I will personally come and hunt you down if you miss the far orange buoy”….indecently the Americans call “buoys” booies! At least that lightened the nerves! The swim was 750 in a straight line along the harbour wall – Jonny was planning to walk down as I swam and see me at the top for the exit. We filed into the water and had a couple of minutes to acclimatise to the temperature 16 degrees, and the horn would go. I made my way up to the top buoy to get a good line as I had seen some people miss that “orange buoy” the day before in the Aquathlon – too close to the wall and you’d have to make a good left diagonal to be able to get to it and then back in. So as I made my way I decided actually I didn’t need to go as far left as I was planning to. All set, aiming to sight on the corner of the building in the distance. Having this line also meant that as a “right” side breather I could keep the other girls in sight and help with direction. This was it! The Horn sounded and we were off! A good solid start – in a Sprint there’s no time to hang around you’ve just got to go for it (within reason!) Swimming along and all was going well. Found myself swimming in a pack of 3 and we were all on top of each other – arms, legs over each other like seals – time to get out of that – so a couple of good kicks, speeding up the arms and I was free. This wasn’t like swimming in a lake at all. There was a swell you only get in the sea that felt very much like “waves”. Luckily I had been in for a practise the day before – some girls were saying – “its just water, whenever do you do a practise swim for a sprint (to be fair this wasn’t any old sprint!). How wrong could they be – Jonny told me not to underestimate that water and it would be hugely beneficial to have a practise. He was right – it definitely would have thrown me had I not been in. 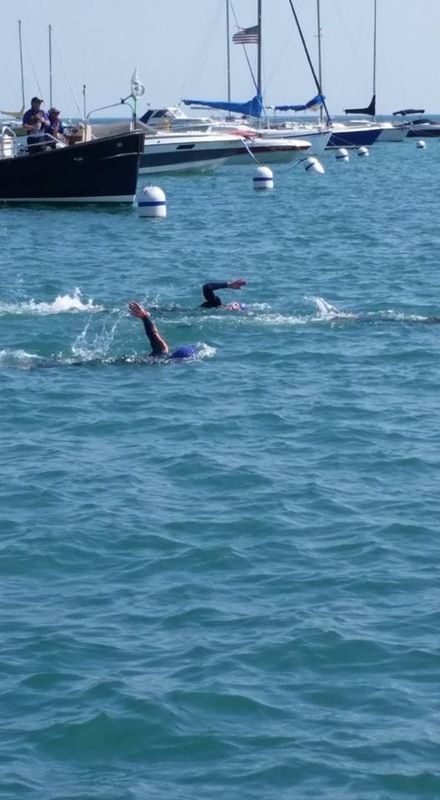 For most of the swim I was worried my line was off and I was making more of a zig zag through the water. I could see some girls to my right but sighting was difficult – that orange buoy was nowhere to be seen. Anyway I just kept going soon it would be insight. I was comfortable but working and the arms kept going and the legs kept kicking. And then there it was…. No diagonal left required I was on track to just come to the left of it and then right turn into the swim exit. I’m never going to be out of the swim in the top pack (at the moment!) so I always know I have some work to do as soon as I’m out of that water. Jonny was on the exit – I could hear his shouts and I was away. 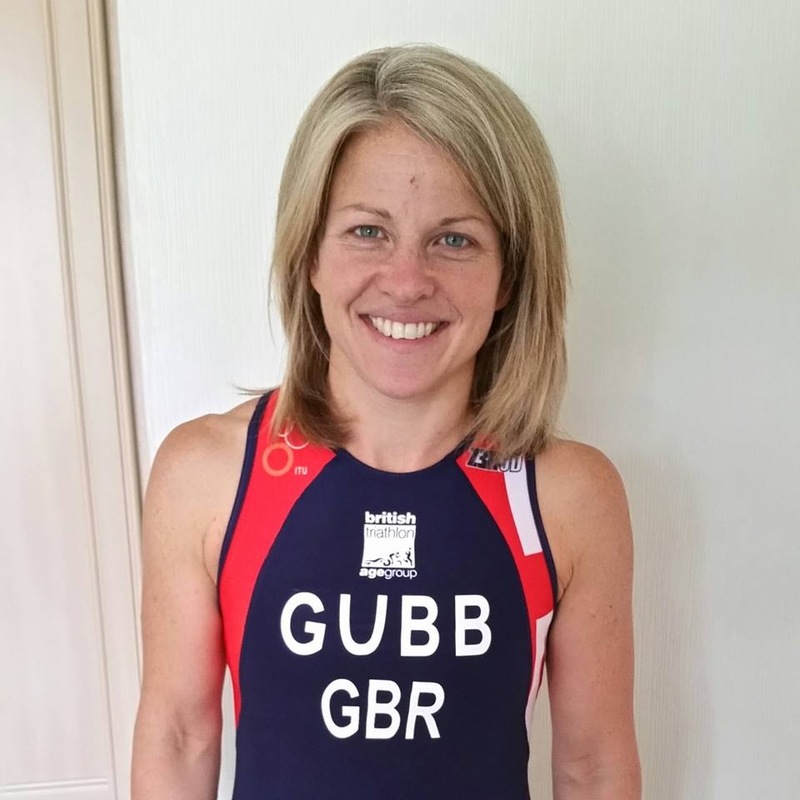 The wetsuit was down to the waist and I had a long transition – crikey I’d put water down my wetsuit as I exited to help get it off in T1 but this was like carrying a couple of buckets in each leg – it was a slow run through but solid. I’d been practising getting the wetsuit off and stream lining what I had to do in T1 so was hoping for a quick turnaround. There was my bike – wetsuit off, helmet on – I was off – it was pretty slick! Out on the bike course. Flying mount, not too much wobbling as I got on and I was away. Picked up the pace, found my shoes and feet were in. The bike course was interesting. For a World Championships you would have thought they could have sorted out the pot holes and crumbling bits of road. But no. You had to have eyes focused at all times. The men had been talking about bunny hoping them or potentially that would be worse. Bunny hop on my TT bike? – I thought I would just try and avoid them! It was a straight 3 lap course with dead turns either end and one sharp left turn two thirds through the lap. Straight down first towards the skyline of Chicago – pretty amazing. On the aeros the whole time pushing on. I was behind one of my Age Group GBR girls and we started playing “cat and mouse” which is never a good idea. So I decided that I wouldn’t keep trying to overtake her, work to the max but overtake by lap 3. It would be a more satisfying race. It worked to my advantage. Although we were in the midday heat I wasn’t over heating but I knew I was hot as I kept having sips of my electrolytes. Usually on a sprint I may have one sip – I think I took on about 300mls altogether. Jonny and some other team mates were out on the course – it’s always great to hear them cheer, gives you so much of a boost. At the end of lap 2 I was feeling good and the pace picked up I overtook my GBR girl and she didn’t come back at me. Suddenly reality kicked in that this was my last lap and before I knew it I would be on the run course heading for home. I kept focused but at the same time ran through my plan for T2 and the run. All was going well I knew I had to come into transition – my feet were out of my shoes and the orange cones for the T2 funnel were insight. Before I knew it I was off my bike and running…….oh no Jonny is screaming at me “you’ve missed transition you’ve got to go back!” What? where was I suppose to be….clearly not here. A nip through the cones would have been a DQ so I quickly ran back with my bike and entered the funnel at the appropriate place! It had all been going so well. Not to worry a few seconds lost but I was on it. A long run with the bike to T2 and back through the sand to re rack. Sometimes after the bike leg my fingers fumble over the clasp on my helmet – this couldn’t happen. Thankfully it was off – the trainers were on and I was off out of T2. Slick. Sand…didn’t even stop to worry about it. I flew out of T2 – Jonny was there shouting me through! As always I started my run fast it was the slightly downhill stretch – I was doing well. It was hot I knew that. There was no shade. But this was 5km how hot could you get over a short distance. And then it hit. As I was later to find out, everyone had the same issue – us Brits don’t do enough training in this heat. It hit me like anything. The pace slowed. I could feel the zapping. But I just had to keep pushing. I knew I could do this. I overtook one of my Age Group GBR girls, which instantly gave me confidence, it wasn’t going too bad. Water was in about 1.5km, head down and focus on the turn around point. The water came and I took a sip and the rest was going over me. Oh dear, I did the ultimate, missed and probably got the lucky runner behind me! Oh well there was another one in 1.5 km. Quick detour to make up kms and then it was into Buckingham Fountain along the blue carpet and round out the other side to head up towards transition to complete one lap -3km done. Right this was it the second smaller lap – its downhill to start so tried to pick up the pace. 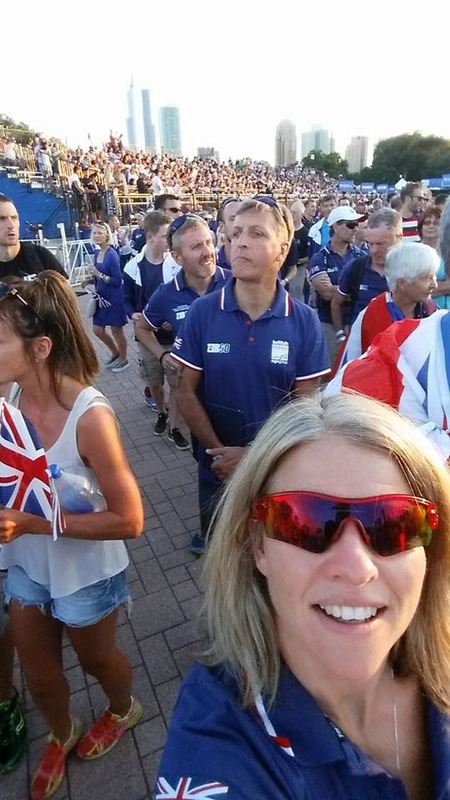 The cheering from all the other GBR athletes around the course was phenomenal. The Brits really do know how to cheer! I’d done a reccy of the run course a couple of days before and promised myself that if it did get tough I had to look up at the skyline of Chicago and remember why I was here – oh crickey I couldn’t do that, that made me far too emotional! So my km 3 and 4 were not a great pace but after passing the water station again – this time the shot was better, it was a case of put absolutely everything into it! Coming around into Buckingham Fountain for the final time was incredible – I actually had no idea where I was in the field. I knew I’d overtaken 1 GBR girl in my age group but that was it. I put it all in for the last 400m – and then there it was the finish line with ITU WORLD TRIATHLON CHAMPIONSHIPS CHICAGO above it! Arms in the air – I’d made it and was smiling! …….and there it was that TV camera right in front of me…..what was I going to do…..I knew my girls were watching at home so instinctively 1 kiss for each of them and big smiles! Id enjoyed every minute of it! I still had no idea where I’d come or my time but I knew I’d done the best I could have done on the day in the conditions and that is all I could have asked for. It certainly was the biggest race of my life so far and one that I will always remember. Racing in an international event amongst the best Age Groupers in the world was a privilege and I am so grateful for everyone who supported me to get me there. I met some amazing athletes and made some great friends this season. In May 2016 I’ll be competing at The European Championships in Portugal. So for now its some down time, until the training starts again in the New Year!